When you start iCaching for the first time, it presents the settings dialog to connect to your Geocaching.com account. Log in and iCaching will get your avatar, username, account type and your logged and hidden caches. Through the API you can make a direct query on the Geocaching.com database. You may query by centerpoint with a distance and refine your query on several properties of caches. You may also query on GC Codes. You can query lite descriptions, without Logs, Additional Waypoints and offline descriptions to speed up the download. When you download the full description you get these properties and also the amount of Favoritepoints (not available in pocketqueries). 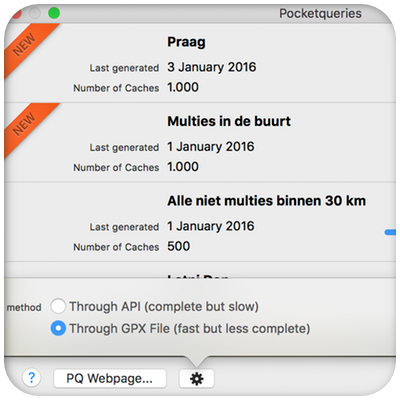 The pocketquery dialog got a complete makeover. Pocketqueries can be downloaded straight from Geocaching.com. You can download as file (fast! ), or download the caches from the query through the API (slow, but including Favoritepoints). 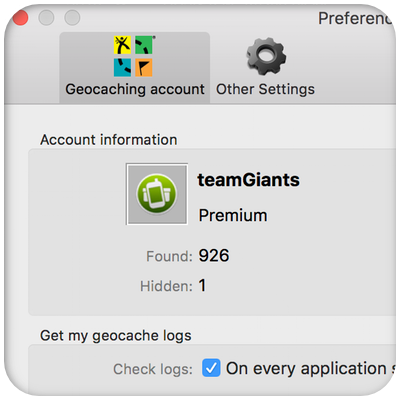 When you click the option in the account preferencepane, iCaching will check for your found caches since the last time you checked. This way your database will keep in sync with your geocaching history. 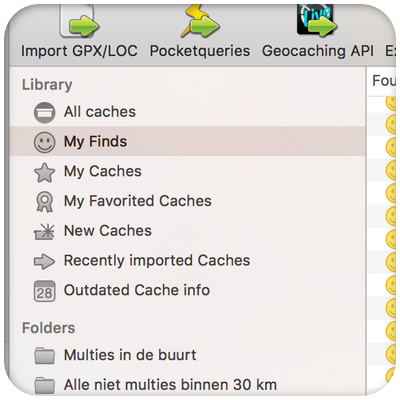 You can go further back in history by downloading more found caches by rightclicking the ‘My Found caches’ in the Library. 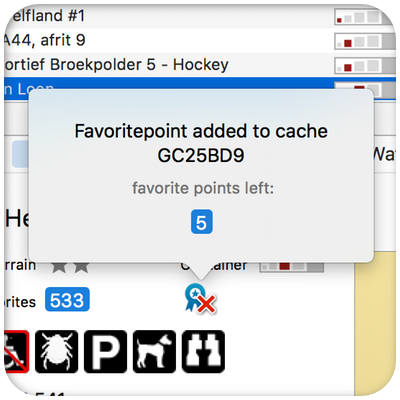 From the Info Tab you can directly add or remove Favoritepoints to your found caches. (Premium members only). 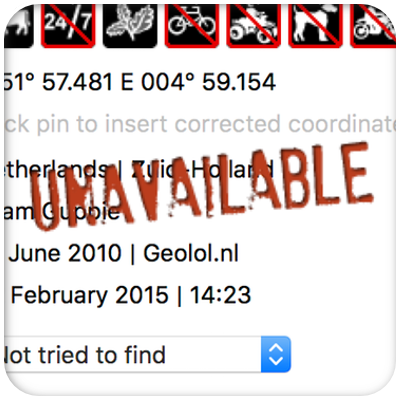 From the cache list you can update geocache availability by rightclick on a selection, or by clicking the ‘refresh’ button in the lower left corner. iCaching will check the available status through the API. This prevents you from seeking archived caches in the field.